​Died fighting a structure fire on March 7, 1924. "Walter A. Cook, chief of the Sausalito Fire Department since June 2nd, 1922, was overcome by smoke while fighting a fire in the basement of the George W. Morton home on Lower Crescent Avenue on March 7, 1924. Chief Cook was working in a remote corner of the basement, far ahead of the other firemen, when he cried out and fell. He was immediately carried outside by firemen Charles Loriano and Paul Ruff. Drs. W. H. Sullivan and C. A. Larson were sent for and worked on him without success. He was declared dead on the scene. On the day of his death the chief was reported to be in good health and fine spirits. He appeared in a new uniform and was rejoicing over his appointment the prior week as Chief Deputy State Fire Marshal for the northern district of California. Although the duties of his new office would have taken him all over the northern part of the stste, he had planned to make his headquarters In Sausalito. Chief Cook was the father of three daughters, Mary, Barbara and Gladys, and brother of John. Robert, George. Louis, and Daniel Cook. Mrs. Sallie E, Armstrong and Mrs. F. Redmond. The deceased chief was buried with the full honors of the San Francisco fire department under the direction of Fire Chief Murphy. The members of the local fire department expressed their thanks to A. Malone, S. G. Ratto, William McCarthy, Gordon Sandstrom, Ernest Sandstrom, Paul Ruff, and all others who assisted at the fire whose names could not be determined." Note: this fire and line of duty death (LODD) occurred long before the arrival and widespread use of self-contained breathing apparatus in the fire service. As of June, 2015, this is the second earliest known LODD in Marin County. Fire Chief Walter A. Cook met death Tuesday night while fighting fire in the basement of an unoccupied dwelling on Crescent avenue. Death, it is believed, was due to suffocation from the dense smoke which filled the basement. He was dragged outside by his fellow firemen and every effort was made to resuscitate the unconscious man by means of artificial respiration, but the attempt proved futile. Cook had recently been retired on pension as battalion chief of the San Francisco Fire Department. He was a life long friend of Fire Chief Thomas Murphy and had hosts of friends in San Francisco, where he had served the department for 25 years. Mrs. Cook had not yet removed to Sausalito from the San Francisco home. The sad news was communicated to her by Fire Chief Murphy. Wednesday of last week Cook was named Chief Deputy State Fire Marshal for the Northern District of California by State Fire Marshall Jay Stevens." SPECIAL NOTE: Chief Cook was on duty in the San Francisco Fire Station that was crushed in the great April 18, 1906 San Francisco Earthquake. The fire house collapse eventually resulted in the death of SFFD Fire Chief Dennis T. Sullivan, and the serious injury of his wife, who were sleeping upstairs in the Chief's Quarters. Here is BC Walter A. Cook's Chiefs Report of that incident and his other responses during the fire that followed the Earthquake, along with some related newspaper accounts. ​See more of his report for the earthquake below. "On the 18th at 5:13 A. M. our quarters were carried down by the dome of the California Hotel; All hands were in bed at the time except Hoseman Maroney who was watch at that time. The roof and third and second floor came down through the apparatus floor to the cellar. Apparatus floor resting on coal pile; Third floor occupied by the late Chief and his wife; Second floor occupied by Chemical Crew and Operators; All went for the stairs except John Coyne who fell through the coal hole. When the crash ceased we started at once to dig for the Chief and Mrs. Sullivan, assisted by the "Bulletin" employees and J. O'Brien [sic], Police Officers Berg, Welsh, Farrell and Tutenberg. While so digging the Chief walked from the rear of the pile. P. Gallagher and Jerry Collins, Chief's Operator, assisted him into the St. George Stables. Chief's Operator drove him away at once to the Hospital. Mrs. Sullivan was taken out shortly afterwards and we carried her into the California Hotel where a Doctor took charge of her. At that time I was requested by someone in the Hotel to try and save Doctor Stinson who was buried in his room on the 8th floor. I with P. Gallagher and John Coyne went at once to the 8th floor where we found that his room was full of bricks and the floor badly caved in from the heavy weight. Thinking that he might be alive we dug for him and found him but he was dead. Looking out of the window from the 8th floor of the Hotel I saw fires in every direction and hearing that there was no water I called for volunteers to get the horses and chemical engine out. The buggies were smashed and buried. We removed the debris from one side of the house to the street getting the horses out and apparatus in two pieces, putting a large bolt in for a kingbolt. I then ordered one man to put the fire out in the heater by covering it with wet ashes. Then taking extra charges of soda and acid we proceeded. We past several large fires and went to work on a small fire on Davis St. between Pacific and Broadway. Putting this fire out we recharged the chemical, and put a small fire out on Front St., between Vallejo and Broadway; then to the corner of Davis and Vallejo Sts., then to the freight carson [sic] East St. between Broadway and Vallejo St. When chemical was discharged we got two small streams from Steamer Topeka, sending the chemical back to recharge at Chemical 5, getting water from a well opposite Chemical 5. This was about 2 P. M. or thereabouts, when Foreman Short of Engine No. 1, of Oakland reported to me with Engine 4, and Hose 1, of Oakland. I then left Chemical in charge of Hoseman Maroney and took the Oakland Company up to Pacific & Sansome Sts., and led from a cistern to Washington St., working with Battalion McCluskey and Murphy. Later the same evening I worked with Chief Dougherty and McCluskey on Merchant St., in rear of Hall of Justice. Somewhere about midnight, or early on the morning of the 19th, I took Engine 28 and Oakland Hose Company No. 1, to Pacific & Montgomery, leading down to Montgomery & Washington, and around Montgomery Block and Washington Sts. to Montgomery & Sansome. I then worked with Chief McCluskey on Stockton, Clay, Washington Sts. and Montgomery Ave. After this I held a consultation with Chief McCluskey and Chief Murphy about getting water from the Bay, as I had been informed by Captain Wolf of the 22nd U. S. Infantry, that the transport tugs were at our disposal. On their advice I led a line from the Bay at the foot of Stockton St. to Engine 31, st [sic] Filbert & Stockton Sts., obtaining our first water from a well. From here we led to Engine No. 5, at Washington Square and then to an Engine at Stockton & Broadway, and down to Powell and Broadway, where I delivered the stream to Chief McCluskey. I obtained my hose from the Corporation Yard No. 2, and returned to the Water front, taking a line from a tow boat at the foot of Broadway we led up Broadway to Montgomery. Here we met Lieutenant Freeman of the United States Navy with a line from the United States Navy Fire Boat, and by coupling our lines together we led up Montgomery Ave., and around the County Jail, working there until early on the morning of the 20th when I left these lines in charge of Lieutenant Freeman. I then returned to the Water front and led two lines from the Tug Boat Pilot, at the foot of Vallejo St. up to Kearny St., where I was joined by Captain Sullivan of Engine 12. Backing down with the fire to Sansome St. where we were drive out on the afternoon of the 20th. I then assisted Captain Wagner of the 22nd U. S. Infantry to lead two lines from the Governor Markham which was lying near the Haslett Warehouses and then left these lines in charge of Captain Wagner and returned, led a second line from the Pilot to the Gibraltar Ware houses [sic]. We worked in this vicinity until daylight of the 21st, and then Truckman Wilson of Truck 2 in charge of these lines. I next went to the foot of Vallejo St., and led a line from the Tug Boat Sea Fox to the freight sheds where we worked all day, moving along the waterfront from Broadway to the Sea Wall." From the files of Battalion Chief Fred J. Bowlen, S. F. F. D.
Dennis T. Sullivan, chief of the San Francisco Fire Department, who was injured in his home on Bush street on the morning of the earthquake by falling debris from the California Hotel, died yesterday, morning at the Presidio Hospital. His death had been expected for two days, and has cast the fire department into mourning. On Wednesday morning while the fire chief and his wife were asleep in their apartments on the upper floor of the engine house on Bush street, a tall chimney on the California Hotel was shaken from its lofty position, by the heavy temblor and toppling over it crashed through the roof of the engine house, completely wrecking the latter. The unfortunate chief and his wife were buried under the debris of the building, but were hurriedly extricated by members of the fire department and conveyed to the Southern Pacific hospital, Later, when it was realized that the hospital lay in the path of the rapidly spreading conflagration, they were taken to the Presidio hospital, where Mrs. Sullivan is still confined, although she is reported to be rapidly improving. The chief was unconscious for a time and died ignorant of the fact that people of San Francisco had missed his services during the most trying period in the history of the State. During his lucid moments he talked of fire department matters with Eddie Graney, who was constantly at his bedside, and dwelt at some length on a salt water system for the city and the value it would be in the event of a big conflagration. Strangely the chief's mind was working out the very problem his assistants were struggling with only a few blocks beyond his death couch. Arrangements for the chief's funeral will be made today. His position as head of the department during his illness was held by Assistant Chief Dougherty, who will probably succeed him. No man has gained greater distinction as a fireman than did Dennis T. Sullivan in San Francisco. An athlete from youth, he was physically capable of enduring hardships, a fact that frequently demonstrated itself during his arduous duties as a fire chief. His rise in the local department was a rapid one and regarded as well merited. He was first an extra man with 12 engine and from that position he rose to hydrant man and then to district engineer. At the death of Chief Scannell, Sullivan was made chief engineer of the department. For years he had carefully, studied various problems that he predicted might some day confront the fire among them conflagration which the city has just suffered, and his friends, while not attempting to discredit the work of Acting Chief Dougherty, believe that if Sullivan had led the departments through its recent ordeal, his studies of conditions might have served 'to greatly lessen' the dangers to which San Francisco was subjected. The funeral services the late Chief Sullivan of the San Francisco Fire Department will take place today (Tuesday) at 1 o'clock from 1984 Forty-ninth avenue, Oceanside. The remains will be placed temporarily in Mount Calvary Cemetery vault. ARCHBISHOP MONTGOMERY SPEAKS FEELINGLY OF “GREAT LIFE” OF THE FIRE FIGHTER. The funeral of the late Dennis Sullivan, chief of the Fire Department, was held yesterday afternoon at his home on the Ocean boulevard. Many of his life-long friends were gathered around his bed, while, Archbishop Montgomery delivered a eulogistic address. Mrs. Sullivan, who is still suffering from the injuries received in the collapse of the Bush street fire house was not present. The Fire Department was represented by the Fire Commissioners, Chief Dougherty and other officials. Archbishop Montgomery spoke feelingly of the great work that the dead Chief had accomplished in his lifetime. After the services the body was removed to the receiving vault at Calvary cemetery, where it will be held until arrangements can be made for its interment at Holy Cross. SAN. FRANCISCO, April 22, 1906. Chief D. T. Sullivan of San Francisco's fire department passed away at 1:10 o'clock this morning from the effects of the injuries received on the morning of the earthquake. Chief Sullivan and his wife were sleeping in the fire house adjoining the California hotel on Bush street. The earthquake shook down the chimney of the hotel and sent it crashing through the fire house. Chief Sullivan and his wife were carried with the debris two stories to the ground floor where they were extricated after great difficulty. The Chief and Mrs. Sullivan were at once taken to the Southern Pacific hospital at Fourteenth and Mission streets, but when the flames reached the Mission district they were again moved, this time to the general hospital at the Presidio. 'It was found that Chief Sullivan was suffering from a fractured skull, four broken ribs and other Injuries. Eddie Graney, was with Chief Sullivan from the time he was removed from the fire house until his death. Mr. Graney today stated that, 'Chief Sullivan never knew there was a fire.' After recovering consciousness the chief took great interest in the affairs of the city being always apprehensive that a fire would break out. He knew from the first that he would die from his injuries, but never forgot the interests of his department. His mind seemed to dwell on the need by the city of a saltwater fire fighting plant, and he repeatedly spoke to his friends of the increasing necessity for such an adjunct to the fire department of the city. Mrs. Sullivan, who suffered serious Injuries, “has progressed satisfactorily and it is believed that she will recover." 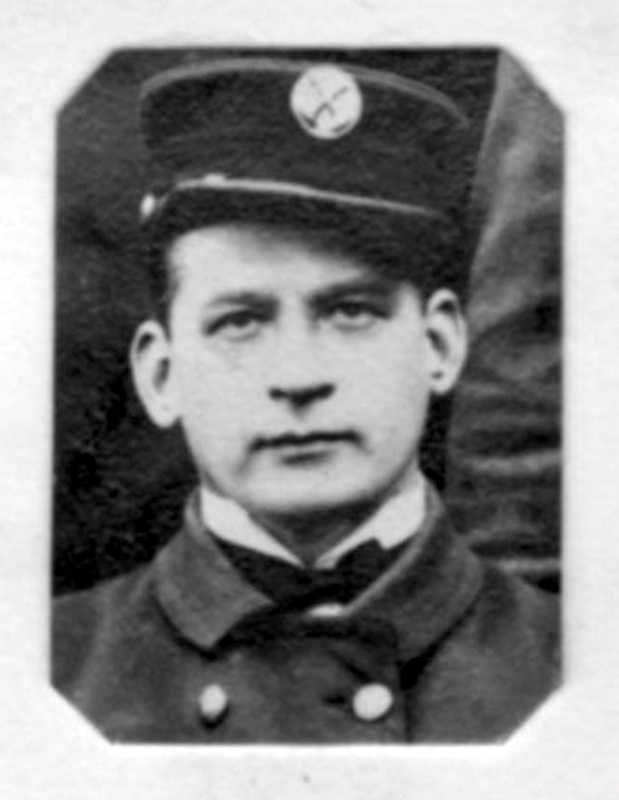 San Francisco FD Battalion Chief Walter Cook, circa 1910.